There are a number of artificial football pitch services which we can provide to ensure you have the best quality sports facility for your organisation. Whether you’re a school, colleges, club or leisure centre, we will work with you to make sure you have exactly what you need. From full construction to maintenance and cleaning, we offer professional services at great value prices. You can speak with one of our experts today and get more information on what we do by filling in our contact form. Just tell us what you are looking to have done and we’ll reply back with some further information about costs. What is a Synthetic Football Pitch? A synthetic football pitch is a sports facility made from synthetic turf rather than natural grass. This has many benefits as these surfaces are porous and suitable for use in all weather conditions. 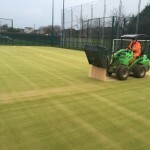 The artificial football pitch surfacing is also much easier to maintain as it doesn’t need mowing, and it won’t become muddy during wet weather. 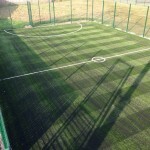 We can install sports pitches in a range of surfaces including 2G sand filled turf and 3G artificial grass. Each different surfacing option can be tailored to suit your requirements in terms of playing characteristics and budget. It totally depends on how you would like to use the area and what your primary sports will be. If you are going to be using the facility for a number of different sports you could choose to have a multi use games area installed, these come in numerous surfacing specifications depending on the sports you want to play. Just let us know what you need and we’ll create the design which will suit your facility perfectly. As well as full construction, another of the football pitch services we offer is cleaning and maintenance. It is important to have your synthetic grass pitch regularly cleaned and looked after to ensure it is kept in top condition and to save on the costs of repairs in the future. This could consist of either proactive cleaning which is carried out regularly to maintain the good quality of the pitch, or reactive repairs which take place to fix any damage or weathering which occurs as a result of overuse or vandalism. 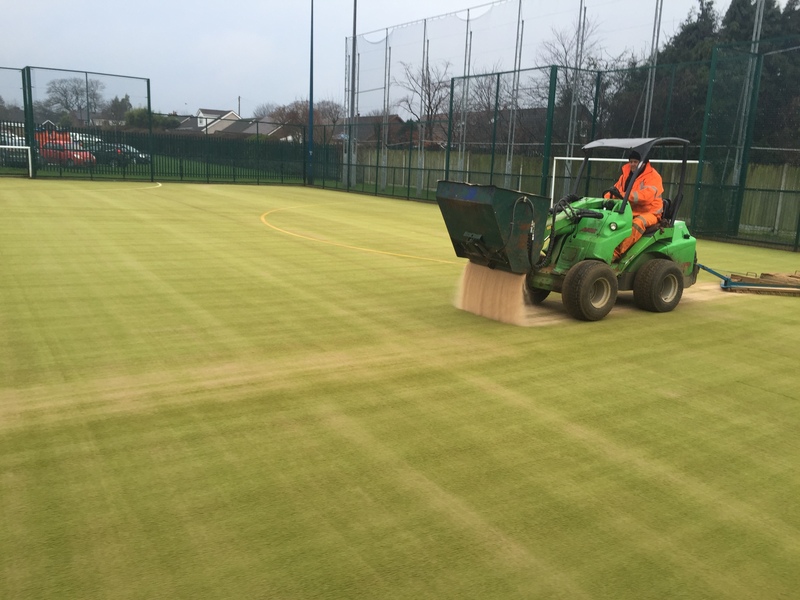 Artificial football pitch maintenance is very important when it comes to keeping the facility safe and ensuring it is suitable for use all year round. Please contact us today if you’d like to find out more about the prices of what we can offer. We’ll gladly discuss your budget and come up with an affordable quote for whatever you need. Just fill in the enquiry box on this page and we’ll reply back as soon as we can to talk about this in more detail. We are able to build completely new soccer pitches in many locations across the UK. This process will usually begin with laying the foundations using a stone sub base to make the surface strong and porous. Next we’ll apply a layer of macadam, and a shockpad if required to help reduce impact on players muscles and joints. The next part of the artificial football pitch construction is laying the turf carpet and securing it to the base with glue. Finally the sand or rubber infill will be applied within the grass to complete the facility and leave the right playing qualities. The costs of synthetic football pitch services can vary greatly depending on the dimensions and specifications of the facility. 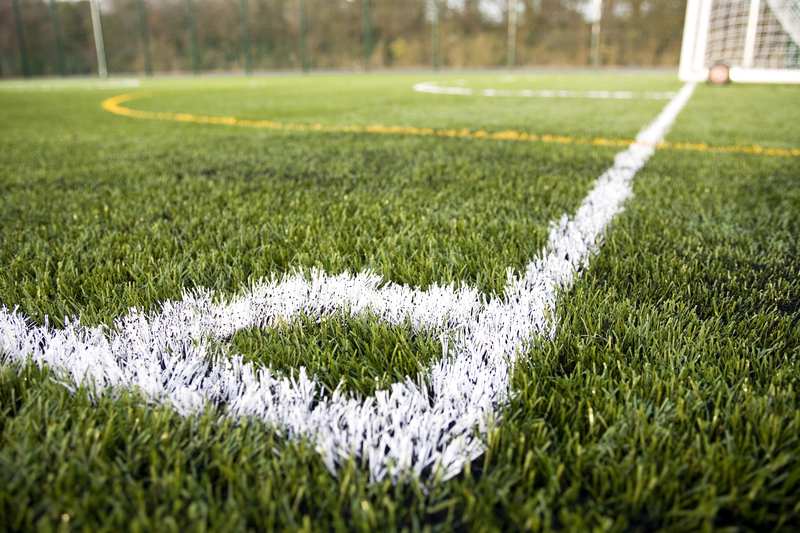 The prices for each type of surfacing can vary and different materials are better suited to different sports so you can choose a sports surface to fit your budget and to meet the required playing characteristics. 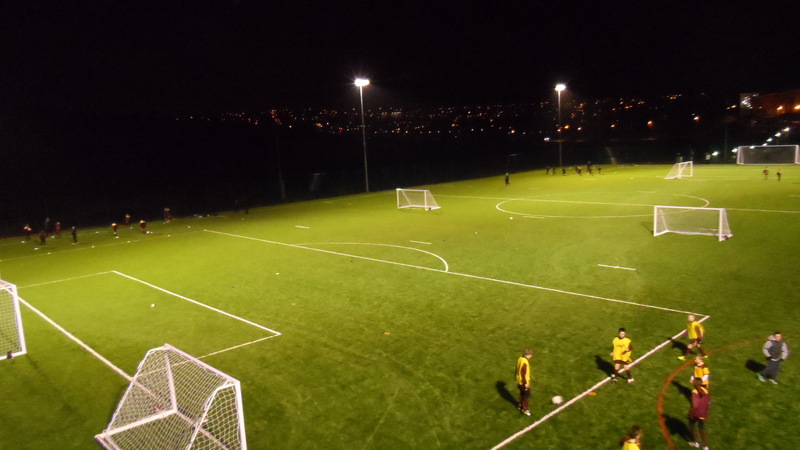 Artificial sports facility services costs can be managed through a number of variables including the specification of the pitch and any extra equipment you need such as fencing and floodlights. We could even alter the soccer pitch dimensions and make it smaller to reduce the costs. 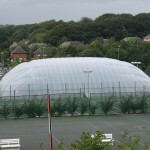 This will help you ensure that you get a great quality football facility but at a price your organisation can afford. Costs and prices can also depend on other factors including location and access to the construction area. Take a look at this video which shows a synthetic pitch construction project that we recently carried out for a school. 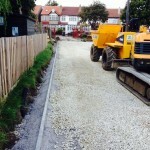 This work involved completely excavating the existing grass area and laying a soakaway system for effective drainage. We then laid a compacted stone sub base to provide maximum porosity and durability for the surfacing. Then the 3G grass was rolled out and secured at the edges and joints to leave a seamless finish with clear white line markings. 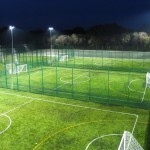 As experienced installers of soccer facilities we have worked on many projects throughout the UK. Some of our clients include schools, colleges, leisure centres and sports clubs, and we offer our expert advice to get the best outcome every time. In addition to building the surface itself, we also provide various different types of equipment which can be added onto the facility. This might include football pitch fencing which is designed to protect the area and keep it secure at all times of the day. 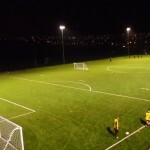 Specialist floodlighting may also be supplied if you wish to use the facility in the evenings for extra training sessions, or to rent out for matches. The costs of maintaining an artificial football surface are also different for every project; these prices depend on the dimensions of the pitch, the type of surface and the kind of work which needs to take place. Sports surface tests can be carried out to determine the best type of strategy for your sports flooring; this could include ball roll tests, anti slip assessments and water drainage checks. The costs will then be dependent on the surface aftercare scheme which needs to be applied to the facility. A surface which is already well maintained will require less maintenance which will therefore reduce costs, however a surface which is in bad condition will need more cleaning and repairs which will of course be more expensive. You can speak to our football pitch consultants to see all of the details on maintaining and building these facilities for both recreational and professional uses. 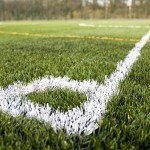 If you need any further information on the 3G football pitch designs we offer, don’t hesitate to get in touch with us. It’s quick and easy to get a quote and we’ll give you all the information you need on the products we offer. You can contact us through our enquiry form if you need a price for installation or maintenance of a synthetic grass facility. We would be happy to discuss all of the different options we provide when it comes to football pitch services. One of our experts will talk about your budget and work out a quote which is perfect for you. Just let us know what type of facility you need and where the project will be taking place. 1 What is a Synthetic Football Pitch?